The first titan arum bloom at UM. Visiting the Maynard W. Quimby Medicinal Plant Garden at the University of Mississippi can feel like stepping into a tropical rainforest – their greenhouse is filled with rare and unusual florae. One of these species, the titan arum, is among the most extraordinary in the garden’s collection. The plant has the largest unbranched inflorescence in the world. One of the garden’s 21 titan arum plants recently bloomed and another is blooming now. This is a rare occurrence for a number of reasons. The garden’s first bloom, which occurred in May, grew slightly over 4 feet tall. It was the world’s first recorded bloom of 2014. The new bloom is already 5 feet tall. The plant has an almost otherworldly appearance. Its inflorescence is composed of the spathe, a petal-like structure, and spadix, the central column. The spathe becomes a dark crimson color as it blooms. The garden’s staff has taken great care to ensure conditions are suitable for blooming. Ed Lowe, senior research and development horticulturist, has worked extensively with the plants. Raman encourages spectators to visit the garden while the plant is blooming. 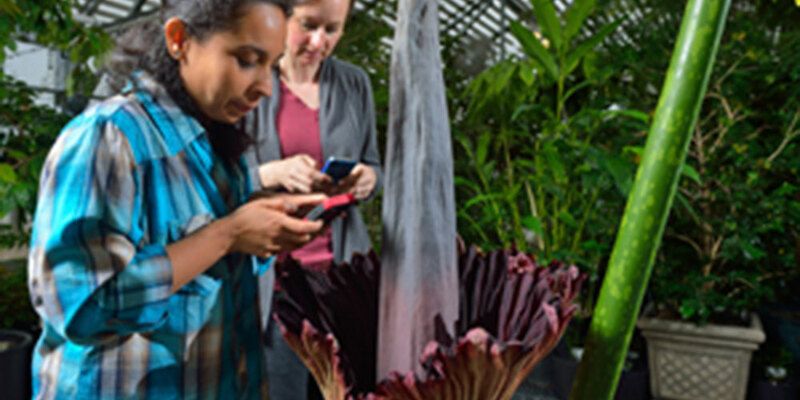 To visit the garden and view its newest titan arum bloom, contact Lowe or Lal Jayaratna at (662) 915-1620.